Nexus 9000 series / 9300 / 9500. Aplication Policy Infrastructure Controller ( APIC ). Cisco recommends a minimum of three APIC servers. Policy Model ( “What talks to what and how” ). 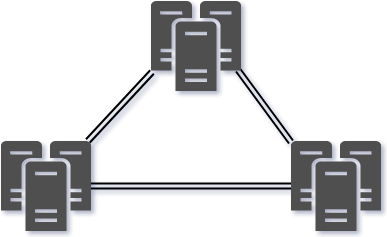 Often in datacenters a layer 2 design is implemented to span VLANs. First define your FabricPath domain, which disables Ethernet. IS-IS enabled Fabric Path Domain. Classic Switch data learned and IS-IS Level 2 ‘Routing Table’ Built. Nexus series Network Virtualisation Technology. “Lightweight” VSS – Combine ports, not switches. Links on different switches to appear as the same device. Downstream device can be anything supoprting 802.3ad (LACP). Commonly called Multi Chassis Etherchannel ( MEC ). 1 Cross Connect to secondary Agg Switch. 12 Access layer switches, 4 Etherchannel-bundled connections. Overleg with the server team connectivity. Many blade servers enter de “enterprise switch” market with an integrated switch. Pass-through cabling or integrated switches. Significant impact on power – cooling – weight. If you use the integrated blade switch, use a layer3 access layer. [Layer 2 on the access layer] connected to a [layer 2 domain within the bladeswitch]. If you use passthrough, use a layer2 or layer3 access layer.